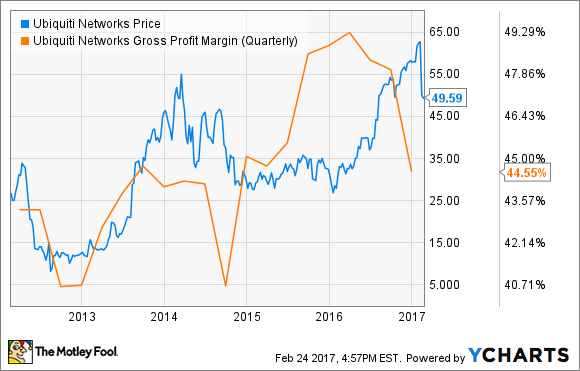 Ubiquiti Networks (NASDAQ:UBNT) reported Q2 2017 earnings earlier this month, and the market reaction was brutal, with the company selling off more than 20% since the report. At first glance, the quarter was not particularly bad, with revenue beating expectations, however, the quarter's EPS of $0.72 missed estimates by $0.05. While increased operating expenses were partly to blame, they were only 11.8% of sales, well within the company's long-term target. Gross margins, however, were a different story, falling to 44.6% from 48% in the previous quarter and down from 48.4% from a year ago. As you can see, the previous dips in gross margin accompanied dips in price, as these previous instances correlated with down quarters and product cycles. 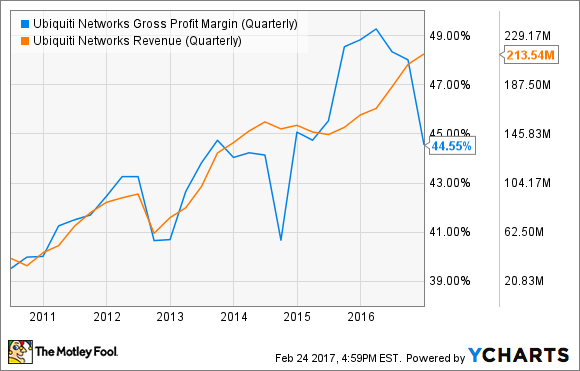 Many analysts have long wondered if Ubiquiti's high margins were sustainable. Many compare Ubiquiti to Netgear (NASDAQ:NTGR), whose gross margins are a mere 28% , far below those of Ubiquiti's enterprise peers, and they no doubt fear that this past quarter may be the first indication of margin compression for the company. Unsurprisingly, the first question on the Feb. 9 conference call was centered on margins. CEO Robert Pera had several justifications for the quarter's margin performance. Ubiquiti is being aggressive in entering a new segment. As Pera explained on the latest conference call, transcript by Seeking Alpha: "As you know, in the history of the company, we never dropped prices, but we very aggressively go after new markets. And a few things happened this quarter. First of all, AmpliFi, our pricing was very aggressive out of the gate ..."
Indeed, the new AmpliFi home Wi-Fi system has been getting stellar reviews, yet it is priced cheaper than lower-speed incumbents such as Netgear's Orbi. To be sure, Ubiquiti is late to the consumer game, so the company is trying to make a big splash, gain volume, and become more efficient in production later on. This is the technique the company used in prior years for its bread-and-butter enterprise products to great effect. ... we also misexecuted the launch. We had to recover. We had some last minute issues with design for production. We had a redesign. I wanted to get it on the shelves because we had such great momentum in terms of our PR and marketing strategy that we had to fill the channel with stock and we took a hit on a lot of air shipments. But from a long-term perspective, it's incredibly important we establish this AmpliFi brand. That indicates Pera is emphasizing long-term strategic thinking over meeting a single quarter's EPS estimates. That's something Foolish investors can get behind. A third reason given for the gross margin compression relates to airMAX ac. ".. we believe we finally solved backwards compatibility issues, and now we are seeing a pretty nice uptick in airMAX ac sell-through," Pera said. "... we also were aggressive on particular [units] to help drive adoption. Again, strategically it's very important that airMAX ac gets adopted for us." Ubiquiti will be rolling out a brand-new technology called LTU this year that is only compatible with the new AC standard. With airMAX ac, Pera is again using aggressive pricing to drive volume, so that Ubiquiti's customers will become used to the company's family of products, and purchase more complementary products released down the road. A final reason for price pressure was the company spending on new distribution centers. The company has traditionally had a very lean model, which was good at previous volumes, but now that the company has grown, it's investing in reducing lead times for its customers. "We do not have the most sophisticated channel in the world, especially on our operator community side and we historically had a lot of frustration with maintaining stock in the channel, which is very important if you're operators and you're deploying networks and picking up new customers, you need a reliable supply," Pera said. While not the ideal scenario, being unable to meet customers' growing demands seems like a preferable problem to have in today's low-growth environment. So, what to make of these puts and takes? It seems to me that Pera is expecting a large uptick in demand, and is willing to sacrifice near-term margins for customer satisfaction, which should lead to increased brand affinity and higher growth in the future. And unlike previous downturns in gross margin in 2012 and 2014, the most recent quarter's margin compression actually resulted in increased revenue. The divergence of revenue and gross margins leads me to believe that unlike previous margin hits in 2012 and 2014, the demand story is actually intact, and that Pera knows the business better than bearish analysts. In light of the recent sell-off, now could be a good opportunity to pick up shares with the long-term perspective. However, one must keep an eye out for new products and revenue growth, and monitor execution as the company scales. Should the company execute better on the production side, margins are likely to tick back up into the 45%-50% target range within the year. If the company is able to replenish its margins in the year ahead, today's price might be a good entry point.